Surely the facts are YIKES! Thousands of relieved passengers poured ashore from a stinking cruise ship on Friday after five days adrift in the Gulf of Mexico with overflowing toilets and stench filled cabins. Exhausted passengers lined the ship’s decks, waving towels and flashlights, cheering and singing “Sweet Home Alabama” as tug-boats pulled the stricken Carnival Triumph into the port of Mobile, Alabama. Some travelers kissed the ground when they walked off, others disembarked wearing the ship’s white bath robes, part souvenir and part protection against a chilly night. With only one working elevator, it took several hours to get the more than 4,200 people off the ship, Carnival said. Passengers were greeted dockside with warm food, blankets and cell phones to call family and friends. About 100 buses waited to carry passengers on a seven-hour bus ride to Galveston, Texas, while others buses departed for shorter rides to New Orleans, as well as hotels in Mobile, before eventually flying home. The end of the saga, documented live on U.S. cable news stations, was another public relations disaster for cruise giant Carnival Corp. Last year, its Costa Concordia luxury liner grounded off the coast of Italy, killing 32 people. Carnival officials said the Triumph, which entered service in 1999, would be towed to a Mobile repair facility for damage assessment. The 893-foot vessel was returning to Galveston from Cozumel, Mexico on the third day of a four-day cruise when an engine-room fire knocked out power and plumbing across most of the ship on Sunday. Passengers described a gut-wrenching stench on parts of the ship and complained to relatives and media by cellphone that toilets and drainpipes overflowed, soaking many cabins and interior passages in raw sewage. Jacob Combs, an Austin, Texas-based sales executive with a healthcare and hospice company, praised the ship’s crew. “Just imagine the filth,” said Combs, 30. “People were doing crazy things and going to the bathroom in sinks and showers. It was inhuman. The stewards would go in and clean it all up. They were constantly cleaning,” he said. Debbie Moyes, 32, of Phoenix told the Los Angeles Times she was awakened Sunday by a fellow passenger banging on her door, warning people to escape. “That was one of the only points in my life I thought I might die,” the mother of four said as she stood in the parking lot. Soon after, she said some passengers panicked. “People were hoarding food — boxes and boxes of cereal, grabbing cake with both hands,” she said. Facing criticism over the company’s response, Carnival Cruise Lines Chief Executive Gerry Cahill boarded the ship to personally apologize to passengers. “I know the conditions on board were very poor,” he told reporters, sounding shaken in a brief media appearance before he boarded the ship. “I know it was difficult. I want to apologize for subjecting our guests to that,” he said. “We pride ourselves with providing our guests with a great vacation experience and clearly we failed in this particular case,” Cahill added. Operated by Carnival Cruise Lines, the flagship brand of Carnival Corp, the ship left Galveston a week ago carrying 3,143 passengers and 1,086 crew. It was supposed to return on Monday. Some passengers said conditions deteriorated rapidly on the Triumph earlier in the week, saying people were getting sick and passengers had been told to use plastic “biohazard” bags as makeshift toilets. “It wasn’t a vacation anymore it was like survival mode. Eat what you can. Snack when you can. It was awful,” said passenger Tammy Garcia. Some passengers said they tried to pass the time playing cards and organizing Bible study groups and scavenger hunts for the children on board the ship. Cahill has issued several apologies and Carnival, the world’s largest cruise company, said passengers will be reimbursed in full plus transportation expenses, a future cruise credit equal to the amount paid for this voyage, plus a payment of $500 a person to help compensate them. There — that should satisfy ‘em! Chandler, the passenger, scoffed at the compensation offer. “There are lost wages, I’ve got a baby sitter at home and I had to take off work,” she said. Some passengers said conditions improved on Thursday after a generator was delivered to the ship, providing power for a grill to cook hot food. Passengers said toilets began flushing again on Thursday and the ship served steaks and lobster – a relief after a steady diet of cold sandwiches of cucumber and cheese. Carnival Corp Chairman and CEO Micky Arison was criticized in January last year for failing to travel to Italy and take personal charge of the Costa Concordia crisis. The tragedy unleashed numerous lawsuits against his company. Here’s the Costa Concordia “in happier times” when Jean-Luc Godard made it a movie star. He has not publicly commented on the Triumph incident. “I think they really are trying to do the right thing, but I don’t think they have been able to communicate it effectively,” said Marcia Horowitz, an executive who handles crisis management at Rubenstein Associates, a New York-based PR firm. Carnival Corp shares closed down 11 cents at $37.35 in trading on Thursday on the New York Stock Exchange. 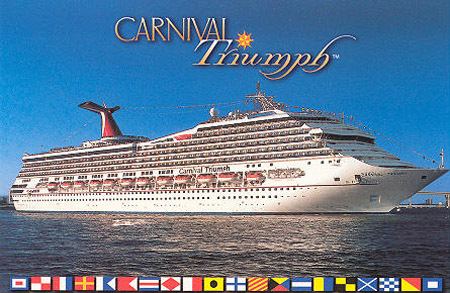 Earlier this month, Carnival repaired an electrical problem on one of the Triumph’s alternators. The company said there was no evidence of any connection between the repair and the fire. For all the passengers’ grievances, they will likely find it difficult to sue the cruise operator for any damages, legal analysts said. Over the years, the cruise industry has put in place a legal structure that shields operators from big-money lawsuits.